Before you pick Altria as a dividend stock, keep these two things in mind. When it comes to consistently treating dividend investors well, Altria Group (NYSE:MO) scores in the upper echelon of dividend stocks in the market. With a solid dividend track record that reaches back for decades, Altria has managed to overcome numerous challenges that threatened its very existence and rewarded those who stuck with the tobacco giant. Yet looking forward, as you assess whether Altria would make a good addition to your dividend portfolio, there are a couple things you should keep in mind to help you make the best decision. Let's look more closely at two things every dividend investor should know about Altria Group. 1. Altria's dividend history is misleading because of its spinoffs. Dividend investors prefer to see stocks that have consistent growth in the amount they pay to their shareholders. Indeed, one of the most prestigious signs of a good dividend stock is qualifying for membership in the Dividend Aristocrats, which requires that a company raise its dividend payment each year for at least a quarter century. But when you first look at Altria's dividend history, you'll see a couple of major reductions over the course of the past decade. In 2008, for instance, the company went from paying $0.75 per share in quarterly dividends to just $0.29. The year before, Altria had paid $0.86 per share, but then ramped it back down to just a $0.69 per share quarterly payment. Ordinarily, a dividend cut of 20% would inspire shock, and a 69% cut would crush the expectations of dividend investors. But those moves didn't faze Altria's stock, and the reason is simple: they corresponded to spinoffs of major parts of Altria's business. In 2007, Altria finally spun off its long-held position in Kraft Foods (UNKNOWN:KRFT.DL). The value of the Kraft shares that Altria shareholders received corresponded to about 24% of the company's total value. As a result, the reduction in the dividend actually represented a slight increase in the proportional payout that Altria made after the spinoff. Similarly, in 2008, Altria spun off its Philip Morris International (NYSE:PM) unit. In that case, Philip Morris represented the larger portion of the business, making up almost 70% of the overall value of the pre-merger company. Again, the dividends that Altria paid after the merger were in line with the domestic segment's previous share of payouts. As a result, most dividend investors give Altria credit for having maintained the upward trajectory of its dividend payments throughout the period. Nevertheless, Altria is not a Dividend Aristocrat, and some sources of dividend information will make it seem as though Altria punished shareholders. It's important not to let that mislead you. 2. Altria hasn't jumped on the major stock-repurchase bandwagon. Throughout the stock market, companies in many industries have boosted the level of their share buybacks, and tobacco has its share of players following that strategy. Philip Morris International, for instance, has spent more money buying back its stock since 2008 than it has in dividend payments to its investors, and Lorillard (UNKNOWN:LO.DL) has had a roughly 50-50 balance between buybacks and dividends over the past several years. Altria, however, hasn't followed that trend. It has made some buybacks in recent years, but they've never risen above around 40% of what the company paid out in dividends during that year. In July, Altria added a new $1 billion stock repurchase authorization, replacing the previous $1 billion program that had been all but exhausted. 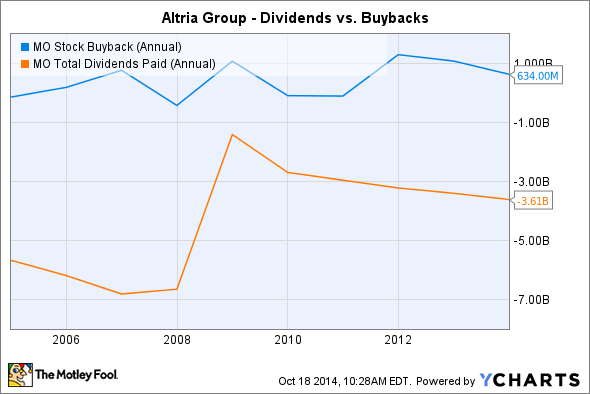 Yet with Altria having paid out between $3.5 billion and $4 billion in dividends over the past 12 months, it's evident that Altria doesn't think that buybacks are the best way to return capital to shareholders. MO Stock Buyback (Annual) data by YCharts. Dividends paid are reflected as negative numbers. Altria's commitment to dividend investors remains impressive, and even as the tobacco industry has gone through the difficult situation of seeing consistent declines in cigarette volume, Altria has kept finding ways to produce more money to pay in dividends. With a combination of smart business strategy and growth prospects in some new markets, Altria has the potential to sustain its dividend prowess well into the future.